It was July 15 and it happened to be my third time attending a huge concert of a K-pop group. Yet it was my first time watching this specific group called Wanna One. The concert took place in Hall 5 & 6 Indonesia Convention Exhibition, abbreviated ICE, located in BSD City, Tangerang. ICE was the biggest convention and exhibition center in Indonesia that offered ten exhibition halls, in which two of them were used to hold the concert. The concert experience I had this time felt exceptionally significant and memorable to me because Wanna One was a temporary, project group that only had one year and a half before their contract ended in December 2018. After that, each of them would go back to their respective entertainment agencies and there would be no more ‘Wanna One’. The concept might be hard to grasp. But one thing that needed to be understood—they were very important to me. I went there with my friend, Ninda. We left from Bandung at 6 in the morning by car and the trip to ICE lasted for approximately 4 hours. It was located in the heart of BSD City, side by side with Santika Premiere Hotel. After seeing the building up-close, I could see why ICE was the perfect venue for hosting a wide range of national and international scale of events. It was indeed of the most spacious exhibition and convention center in Indonesia with not only one, but ten halls to offer. The sun was blazing hot and it was already crowded even outside of the concert venue. I scanned through the people passing by, holding and wearing various stuffs with their favorite member’s name and face plastered on them. The sound of chatter, laughter, and people offering the merchandises they were selling resonated through the place. Some of these people might felt the same thing as I did; that this would be the last chance to see their favorite group live. First things first, we got into the line to exchange our e-voucher tickets with physical tickets. It was only 10 in the morning yet the queue was already so long and reached the sidewalk outside the entrance. I was actually worried we would be stuck under this scorching hot sun for hours just to exchange our tickets. 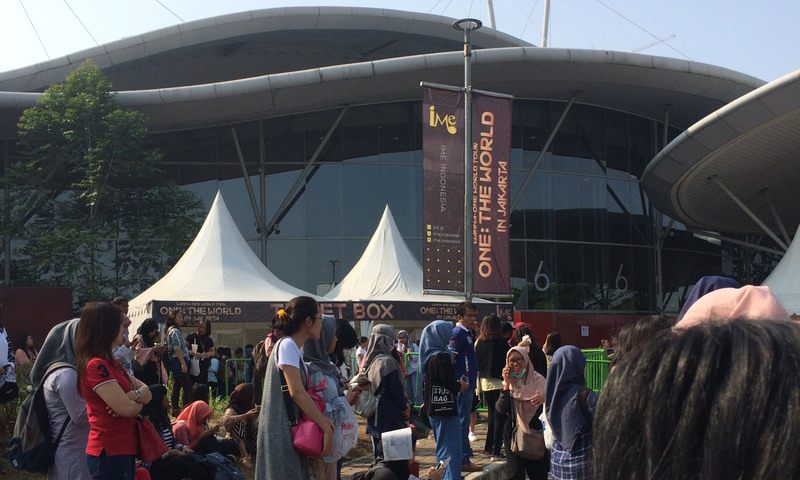 But in the end, it went smoothly because the ticket boxes for standing and seating zones were divided and the staffs also did their job well. Luckily, we got our physical tickets—in a form of wristbands—just around 20 minutes after we started queuing. It was really kind of fascinating how there were Wanna One fans, which were called Wannables, everywhere wherever we threw ourselves to. Some were wearing jerseys with their favorite member’s name, some were wearing headbands, and some were carrying piles of banners. There were even many generous hearted fans willing to give out free goods, such as printed photos, banners, cards, stickers, hand fans, and snacks, for everyone. The latter part was the funniest in my experience, because fans always aggressively scrambled to get the free goods since they had limited amount of items to give. If there was a crowd, the biggest possibility would be someone was in the middle of giving out free goods there, and then it would only attract more people to come and join the battle. I was actually irritated by the violent action of some of the fans. But at the end of the day, I also joined them scrambling to get the items of certain members I liked the most. If you could bring something home without having to pull out your wallet, why not? The gate to the concert hall would only be open at 3 in the afternoon. So, after fighting our lives to get the freebies, we then spent the rest of our time resting inside one of the ICE halls that was used for another exhibition for the day. And as I expected, the hall was also full of Wannables. The clock struck 3 and we rushed to the entrance to get our tickets and bags checked. We saw people already queuing and there were various foods and drinks being taken out and separated by the security staffs because they weren’t allowed inside. We were yet welcomed by another awfully long line after we passed the security check. We naively joined the line, thinking it was a queue to get into the concert hall, before someone told us that it was, apparently, a line to use the toilet. Both Ninda and I actually bought standing zone tickets, but we chose different sections so we had to part ways. To get in, we had our own queue numbers and mine was 500-ish. No, it honestly wasn’t that bad. Since the queue number for each standing section reached more than 1,500. That meant there were 1,000 more people queuing behind me. When I was finally allowed to get inside the concert hall, there were already a lot of people filling the front part of the section. I tried to squeeze my way through all those people to get the best view possible. There were three big screens for us to see the artists better. The stage was also high, big and wasn’t only limited to the rectangular main stage I usually saw at local festivals, but also had an extension stage in circular platform for the artists to walk around and get even closer to other fans. I chose the zone that was on the right side of the extended stage because I wanted to be able to see everything. After an hour of another waiting while standing and being squeezed by an enormous amount of people around me, the concert was finally starting. The lighting gradually went off. People started screaming. The venue screen turned on and showed a pre-recorded video of the artists. People started screaming even more—and pushing. The first 20 minutes of the concert was, you could say, hell. I could only think I was going to die in my standing section because it was over packed and the fans around me were violently pushing each other. As I was kind of close to the stage, it made me unable to breathe and I struggled so hard not to fall. “NO PUSHING! Everyone please step back! Step! Back!” The male staffs in front of my section had said, trying to get us under control. But it wasn’t enough. “Someone fainted here!” I heard people around me yelling and shouting. Body odor was the only thing I could smell at that moment. It was disgusting. For a second I had this thought that I was going to regret going to this concert. My first and last Wanna One concert experience wasn’t supposed to end like this. Things became out of control. The organizer even had to put the concert on hold for almost half an hour for our own safety’s sake. I felt so bad. I felt so bad for the artists. “Wannables, please behave yourselves or else we have to regretfully cancel the concert.” The organizer representative had warned. The standing zone ticket-holders were then told to sit down in order to make room for everyone to breathe. Except we couldn’t because well, once again, it was over packed. We were told to sit down and then stand up again multiple times. I had gotten very exasperated at that point. After almost half an hour, the situation had finally calmed down. Wanna One came back on stage and fortunately there were no more pushing. I could finally enjoy the concert to the fullest, even though most of the time I got distracted by people’s phones being shoved up in the air. Viewing their performance without alternating cameras and not through laptop or phone screen did show the complexity and difficulties of their stage choreographies. I could see they had substantially and exponentially improved in teamwork, dynamics, and synergy in just one year of debuting. Even though in my eyes it was already evident how good and talented they were by watching through screen at home, seeing them live sure set an even new perspective. They made me happy, undoubtedly.